Hamas terrorist arrested, charged after attempting to infiltrate into Israel, attacking soldiers during riots and smuggling weapons. The Southern District Attorney's Office filed an indictment in the District Court in Be'er Sheva against Suleiman Kadhi, a 20-year-old resident of Gaza. Kadhi is charged with offenses against state security of providing service to a terrorist organization, prohibiting the use of property for terrorist purposes, transporting weapons, rioting, sabotage with aggravated intent that constitutes a terrorist act, and more. 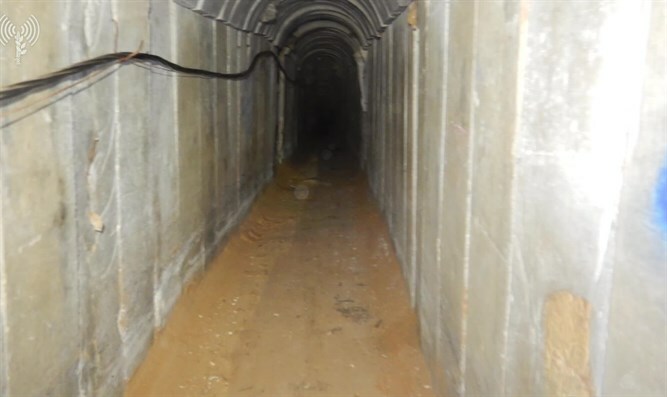 According to the indictment, Kadhi underwent military training on behalf of Hamas and later smuggled goods into the 3.5-kilometer-long smuggling tunnel from Egypt to the Gaza Strip, which was constructed by by the Hamas terrorist organization. During the course of 2017, Kadhi took part in the smuggling of hundreds of sacks of ammunition, explosives and motorcycles for use by Hamas, aware that they were being transferred to the organization for the purpose of their war against Israel. Kadhi's role in the smuggling was to unload goods from the Egyptian side to others waiting for goods inside the tunnel and transferring them to the Gaza side, to the hands of four Hamas terrorists dressed in civilian clothes who were waiting at the entrance to the tunnel. The indictment also states that from March this year until his arrest, Kadhi participated in demonstrations held in the framework of the 'March of Return' near the border fence between Israel and the Gaza Strip, east of Rafah. During the demonstrations, the defendant wore a mask and threw stones at the IDF soldiers with the aim of hitting them and causing them serious injury. In May of this year, Kadhi participated with others in breaking into the Gaza side of the Kerem Shalom border crossing. The burglars caused great damage to the passage and destroyed much of it. During the break-in, Kadhi stole gasoline from the Kerem Shalom crossing. In addition, during a demonstration on the day of the transfer of the US embassy to Jerusalem, Kadhi participated with others in pulling on the barbed wire protecting the border fence, in order to infiltrate into Israel and cause damage to the border fence. In the course of the Friday demonstrations, Kadhi, with the help of gasoline he was buying on his way to the demonstration, torched tires that were distributed by Hamas in order to harm the IDF soldiers' ability to see. Two and a half weeks ago, Kadhi arrived at the entrance to the border fence, crossed the fence and approached a distance of ten meters from the electronic fence, intending to enter Israeli territory. IDF soldiers guarding the border noticed Kadhi and ordered him to raise his hands and enter Israeli territory, where he was arrested.